November is a time for keeping your feet on the ground while all around you seems to be in chaos. You will need to concentrate on getting things sorted and working through the challenges that life throws at you. Try not to charge around like a headless chicken, you can achieve what you need to if you just take a breath, keep your head down and keep going forwards. You will be faced with boring tasks to sort but you know you just need to crack on and you will soon have them licked. You are more than capable of dealing with whatever November brings. In this card, we meet the Goddess of Justice, Athene, daughter of Zeus and the Goddess of Wisdom, Metis. As with the God Ares, Justice has warlike tendencies. However unlike her brother, Athene comes from the standpoint of logic, intelligence, strategy in battle and the preservation of truth. But it wasn’t all war and battles, she was also known for the art of taming horses, weaving and embroidery. 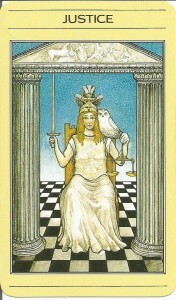 In this card, we see Athene with long golden hair, dressed in a white dress, with a white body plate and helmet. She sits on a golden throne, holding high a raised sword in one hand, golden scales in the other, and a white owl perched closely on her shoulder. She is seated underneath two white stone pillars, the flooring is made up of small black and white squares, much like a chess board, and behind her, the sky is a rich but fading blue. Step inside this card for a moment, this is not a place for warm fuzzy feelings. Here we only deal with logic and reasoning, not emotion and passion, a balance of thought together with a balance of action, thinking things through before we speak and act. Justice does not bring with her warmth, but she does bring comfort, security, protection, wisdom, justice. Athene dedicated her life to the pursuit of pureness and chastity. She never allowed herself to be influenced by irrational thought and emotions, and it is that aspect of Justice that we must also try to take into ourselves. She is a calm, cool headed character, who will always think things through first, without flying off the handle. 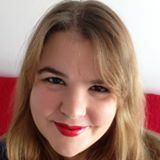 On an emotional level, her level headedness could be considered as cold hearted, unapproachable, and an unwillingness to empathise and connect to human emotion. During situations of conflict, proceed only after the options have been weighed, a plan has been formulated, and several back up plans are also in place in case anything unforeseeable happens. Justice may also represent the need to seek legal or professional advice. Today you may find yourself in an emotionally charged situation. It is important to remember to keep a cool head as now is not the time to allow emotions to get the better of you. Try to detach yourself from the situation if you can, by mentally or physically walking away to collect your thoughts. Don’t make any rash decisions before thinking through the pros and cons and only speak or act on something once your mind is clearer and more rational. Here in the Knight of Pentacles, we meet Aristaeus, son of the Sun God Apollo and Guardian of the Flocks. In his lifetime, amongst many other things, he has learned the art of curdling milk to make cheese, beekeeping, healing and prophecy. In this card, we see Aristaeus dressed in a green tunic, with a brown leather body plate and helmet. He is mounted on a fine brown steed, and carries with him a single pentacle and a sheaf of wheat. He stands in lush wooded green pastures, with beehives and a flock in the background and clear blue skies overhead. Step inside this card for a moment, and feel the stillness, the sense of living in the moment, of just being in the here and now. Feel sense of calmness over oneself as well as a deep love and respect for nature and the Earth Mother. 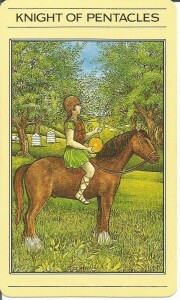 With The Knight of Pentacles, comes the image for our ability of creativity, industry and diligence of service. Although Aristaeus himself was not considered a ‘true hero’, he was a lover of the countryside, of animals, both wild and domesticated, and above all else, he was kind, with a willingness to work long and hard, yet in himself remain humble and grounded to the Earth. When we see the Knight of Pentacles, we are reminded that no matter the task, if we too remain humble, great contentment is ours to have. Sometimes in life it can be all too easy to focus only on the glory, on what we get from a situation as opposed to what we can offer. The benefit to us therefore, over the benefit for others becomes the overriding objective. Whatever the situation, or the job in hand, Aristaeus reminds us to accept the task with good grace, even if it appears boring and pointless. Now is the time for you to develop these humble qualities, give yourself a break from the pursuit of glory, just for a moment, and open yourself up to the chance of contentment and happiness by living and enjoying the day to day life of now. Butterfly dreams - these colourful creatures have a magical quality and if they appear in your dreams it will mean that a process of self healing has now begun. You will find you have new energies which will enable you to leave a difficult phase behind you. Butterflies in myths and legends - an old Indian myth tells us that if you whisper your wish to a butterfly they will keep your secret until they fly upwards and away to find the great spirit. Your wish will then be granted. According to Irish legend butterflies have the ability to carry the soul and cross over to the 'otherworld'. Butterflies signify creation and transformation. Dowsing can have lots of practical uses and you can dowse with something as simple as a short length of cotton with a ring or similar small weight tied to the end. When you think of dowsing what comes to mind usually is someone striding across a field holding two metal rods, looking for water! But there are more fun ways of dowsing that don't involve wellington boots and a raincoat. Lets begin! Firstly, keep an open mind and very relaxed muscles. You need to know which way your pendulum is swinging...... at the very least which way means yes and which means no! Everyone is different. 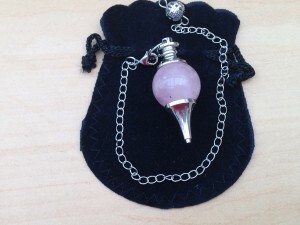 Pendulums work from your unconscious energies. Hold the top of the chain and dangle the weight over your open hand. Make sure it is not swinging about and when it is still concentrate on the pendulum. Keep your hand and arm still, it is sometimes better to hold it in you non dominant hand. Ask a question, either out loud or in your head, for which the only answer is yes, such as - is my name Fred/Sue etc. You may need to ask a few times until the pendulum slowly starts to swing. If it swings strongly from left to right then you know that this is your pendulum giving you a 'yes'. Try the same thing again with something that needs a 'no' answer. You will find that the pendulum moves backwards and forwards. Now you have a definitive yes and now from your magic pendulum! You can double check with other yes now questions if you cannot quite believe what you are seeing and it makes you feel better! Here's another little trick to try - put a coin on the table, hold the pendulum about 2" above it and 2" away from it. Now clear your mind, wait and watch. You don't need to do anything at all, in a few seconds the pendulum will swing strongly towards the coin. Then, move the coin or the pendulum to a different position so that the pendulum needs to move in a different direction to find the coin. What happens now? Yep, clever isn't it! If you lose something at home, here's how you could get some help to find it. Draw a rough sketch of the room you think your object is lost in and dowse over the picture with your pendulum. Ask is the object is in this room. If you get a no just go on to the picture of the next room. When you get a 'yes' you can split the room into quarters and dowse over each area to narrow down your search even further. Dowsing is all about picking up the vibrations of things using the power of your subconscious. Give it a try and have some fun! The Fool is represented by the Greek God Dionysus, wearing an ivy crown and leopard skin, which are particular symbols of this God. It is the first card of the Major Arcana in the Mythic Tarot deck, and it’s number is 0. A red cheeked Dionysus is on the edge of a cliff, and looks like he is about to take a flying leap. Behind him you see a dark cave, and directly above, an eagle is sitting and watching on a tree branch. In the distance, the landscape is that of dunes, a path can be seen in the middle and the sun is setting against a pale blue sky. His father – Zeus, was known as the God of the sky, lightening, thunder, law, order and justice. Zeus was a bit of a lad in the Ancient Greek world, whose numerous ‘romantic liaisons’ resulted in several godly and manly offspring. It is interesting to note that his symbols are the thunderbolt, eagle, bull and oak, meaning that the eagle depicted on this card, could be symbolic of Zeus the father overseeing the actions of his son. His mother – Semele was a mortal priestess who was seduced and invariably impregnated by Zeus. To make this story brief, Hera (the wife of Zeus), on hearing of the pregnancy, befriends Semele and put doubts into her mind that Zeus was in fact a God. Because Semele then demanded that Zeus prove his divinity, and because he loved her so much, he did as she wished. The only snag however was that mortals cannot look upon Zeus without incinerating, so true to form she perished, but not without Zeus rescuing the unborn baby and sewing him into his thigh (as you do) for a few months until the baby Dionysus was born, which led onto him being called ‘twice born’. Later on in the story of Dionysus, we see him rescuing his mother from Hades, who then became a Goddess on Mount Olympus with the new name Thyone. He is the God of wine, fertility, rebirth after death, and a patron of the theatre and the arts. On the one hand he was considered with joy and divine ecstasy, on the other, rage and madness. When looking at this card, I ask myself, is he bright eyed and red cheeked because he is excitedly hurtling himself towards great adventure? Or is it because he has simply gone a little mad, is blind drunk and Apollo dared him to jump of that cliff for a bit of a laugh? Is he about to walk off this cliff because he young and foolhardy, inexperienced, takes action without thinking things through and is just plain naïve so doesn’t know what the consequences of his actions could be? Is that necessarily a bad thing? Does the eagle above him symbolise a certain kind of wisdom, or the implication that someone is watching over you? What’s at the bottom the cliff, where is he jumping off to? One thing is for sure, for better or for worse, Dionysus is definitely about actions when commencing a new venture, whether that is slotted in within the health, wealth, love or happiness category will depend on what is going on with the other cards around him. When reading with this card, it is important to take into consideration whether it has come out upright (positive association) or reverse (warning), and how that relates with the other cards that have been dealt in the particular spread you are reading.